Stocks continue to churn higher, seemingly inflicting as much pain as possible. Bulls who missed the train keep looking for a dip to buy. Bears keep expecting the market to pullback and both parties are getting frustrated. Let’s look a few top stock trades for Thursday. Bank of America (NYSE:BAC) ripped higher on Wednesday, climbing more than 7.5% after the bank easily topped earnings and revenue expectations. For the most part, the sector’s price action has been attractive, even with many names now rallying into what was strong previous support. 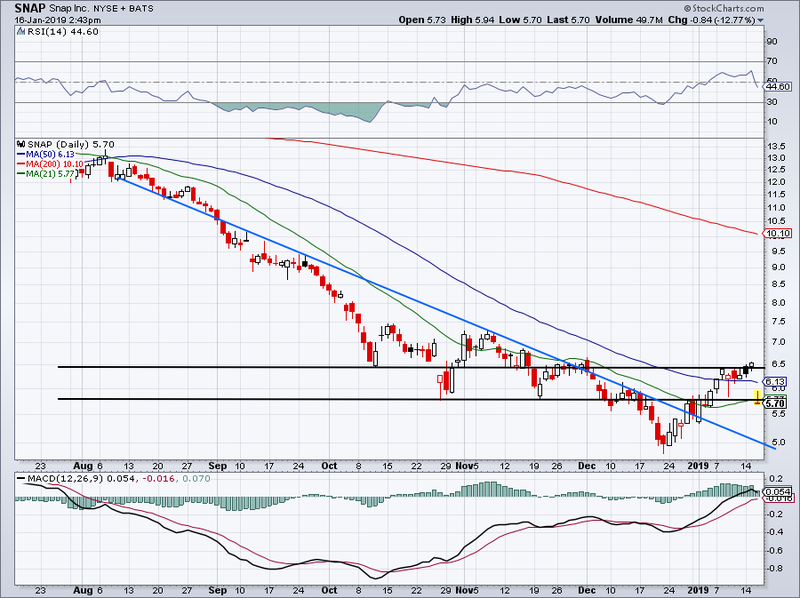 BAC has already pushed through several potential downtrend resistance marks and now faces the $28.50 to $29 level, which was prior support. It’s also hitting the 200-day moving average. For bulls that have been long BAC as a trade, perhaps consider booking some profits into this area. A breakout over $29 obviously triggers another long setup, but until that happens, let’s wait for a pullback. Not many big banks have suffered as bad a fate as Goldman Sachs (NYSE:GS) over the past few months. However, that could be turning around as the company crushed earnings expectations, igniting a 9% rally on Wednesday. The move pushed GS right through the 50-day moving average and up toward $200 per share. 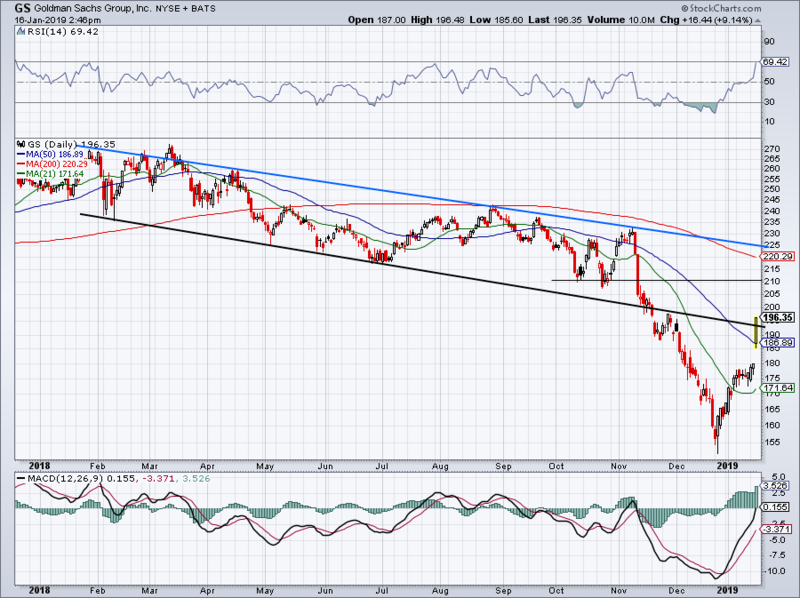 I like that GS is set to close over prior downtrend support (black line). Goldman Sachs is a buy-on-dips stock now provided that it stays over the 50-day. On a continued rally, look for GS to test $210. Ford (NYSE:F) is down 5.5% on Wednesday following the company’s preliminary earnings update. It also follows the company’s announcement at this week’s Detroit Auto Show and new alliance with Volkswagen (OTCMKTS:VLKAF). The stock was perfectly rejected from $9 and dropped below the 50-day moving average. Bulls will want to see the 21-day moving average hold as support. If it doesn’t, the lows are back on the table. Think about this action though. 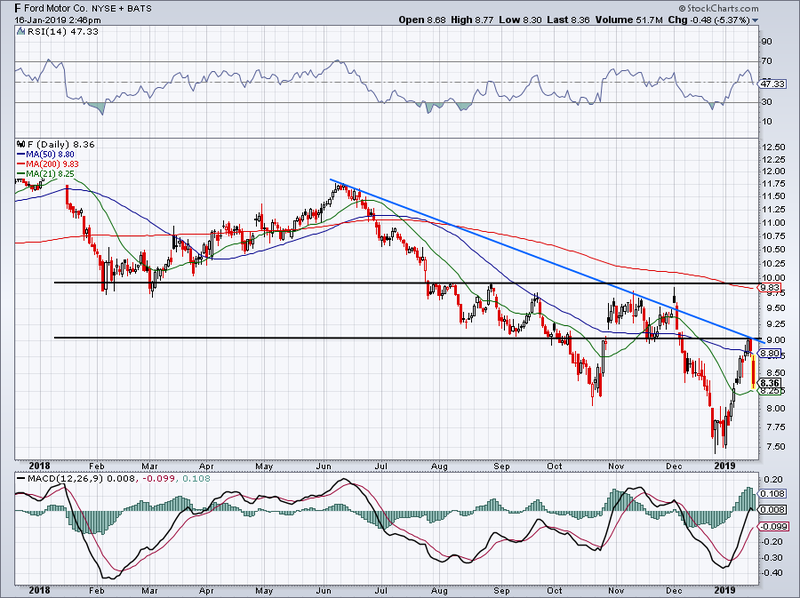 Why own a struggling Ford when investors can own General Motors (NYSE:GM), which rallied last week as management updated investors with better-than-expected earnings. For bulls to truly get excited with Ford, shares need to clear the 50-day moving average and downtrend resistance (blue line). Over $9 wouldn’t hurt, either. The company continues to disappoint, and it’s not helping that Snap (NYSE:SNAP) stock is down 13% after announcing that its CFO is stepping down. Rejected from $6.50 and SNAP is back in free-fall. The 50-day, 21-day and $5.75 level isn’t helping as support. Short of a reversal higher, Snap could easily retest its lows at this point. FANG has been trading well lately, like Netflix’s (NASDAQ:NFLX) more than 50% rally over the past few weeks. Facebook (NASDAQ:FB) has been doing well too. Now though, the stock finds itself right back into what was strong support back in April during the Cambridge Analytica scandal. I would expect this level to act as resistance and so far it has. 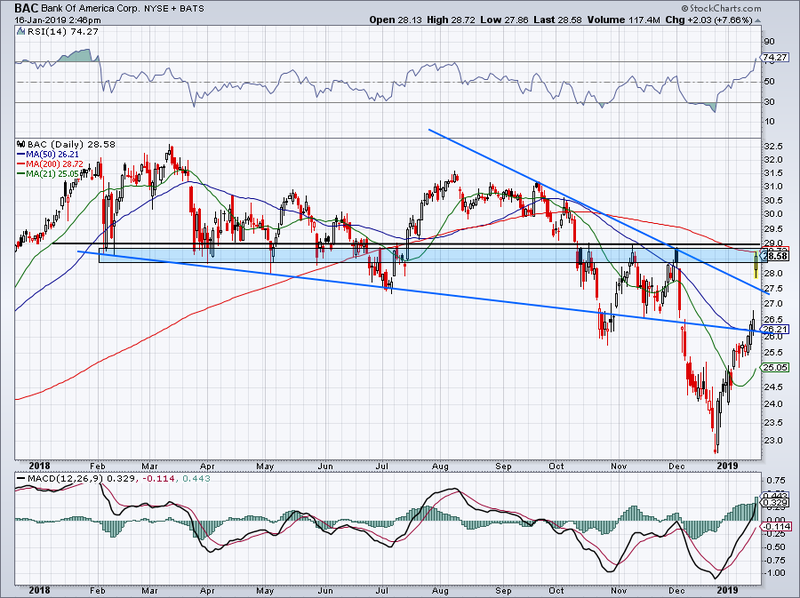 However, consolidating just below this mark, FB stock could push through. Netflix reports earnings on Thursday. If the stock pulls back, it could weigh on FANG and cause a pullback. Of course, the opposite reaction is possible too. If FB pulls back though, I want to see the $137 to $140 level hold up. 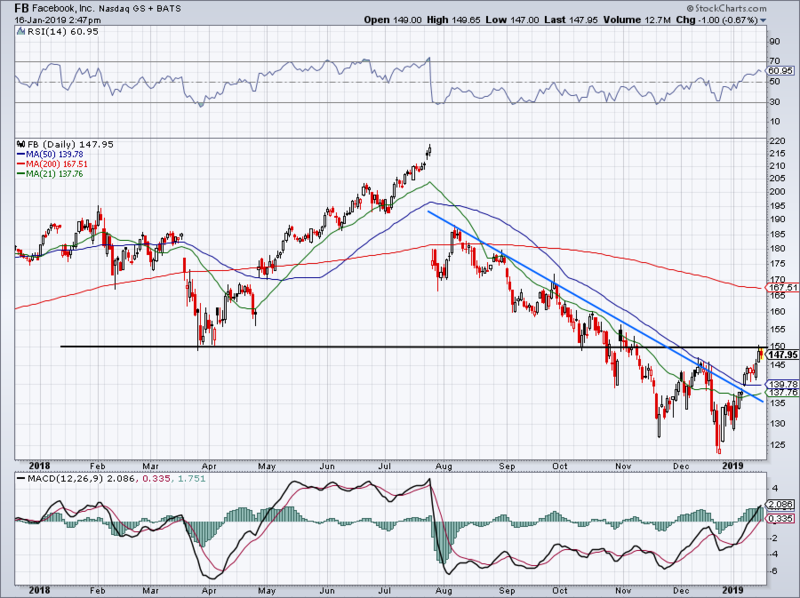 At the very least, we need to see Facebook stay above prior downtrend resistance (blue line). Article printed from InvestorPlace Media, https://investorplace.com/2019/01/5-top-stock-trades-bac-gs-snap-fb-f/.